One of my popular posts was how to look elegant in bad weather, as it addressed how to dress in London most of the time. Conversely this post is only relevant in the UK for ten days a year. Or so I believed. Apparently the number of hot days the UK experiences each year has increased from about 10, on average, in the 1960s, to about 25 a year during the past decade. And, according to the Financial Times this week “hot summers are expected to become far more frequent in the next few decades”. So for a nation that finds air conditioning unnecessary and too cold, and rarely takes off its vest, this will require some adaptation. We will have to get into the habit of carrying sunglasses and sunscreen, rather than a compact umbrella, in our handbags. We might have to consider actually sun bathing on beaches rather than just whipping off our jumpers, and hitching up our skirts, on any bit of suitable green land. And maybe our wine will stop being a joke (to the French at least). So what to wear, to work, when it is 37 degrees? Should you go for a see-through version of your usual outfit? For me the last few days have been brilliant. I have managed to get some wear out of my favourite dresses. I have worn my hand painted floral SWAP dress, my YSL Mondrian dress and the Geoffrey Beene white dress. Without a jacket or cardigan! With my flat pink or brown leather ballet flats. It felt so lovely to walk around with bare arms and legs – not something we experience regularly in London. Here are two of my colleagues from Notting Hill Housing looking absolutely appropriate at work yestrday. 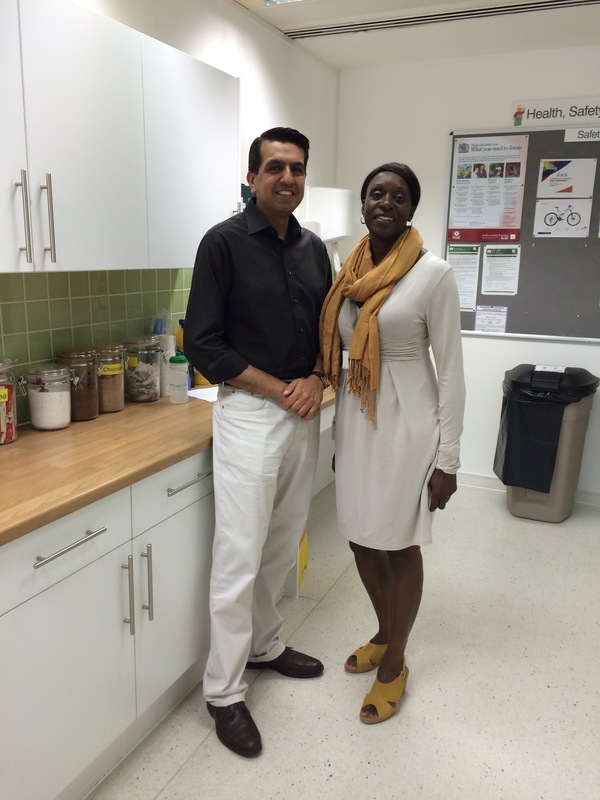 Haroon and Eve are members of our super IT team. Don’t they look great? Like models! Haroon is wearing a dark shirt and shoes with a pair well cut light stone trousers. And Eve has a nice comfortable but smart jersey dress in a similar light neutral shade. The yellow shoes and scarf and interesting earrings just set this outfit off to perfection. We have the air conditioning on and the scarf is useful if it turns cooler on the way to and from work. The Trades Union Congress has suggested what they want to see the working classes wearing in this weather: shorts and a vest. I am not sure about the vest but shorts are definitely acceptable. 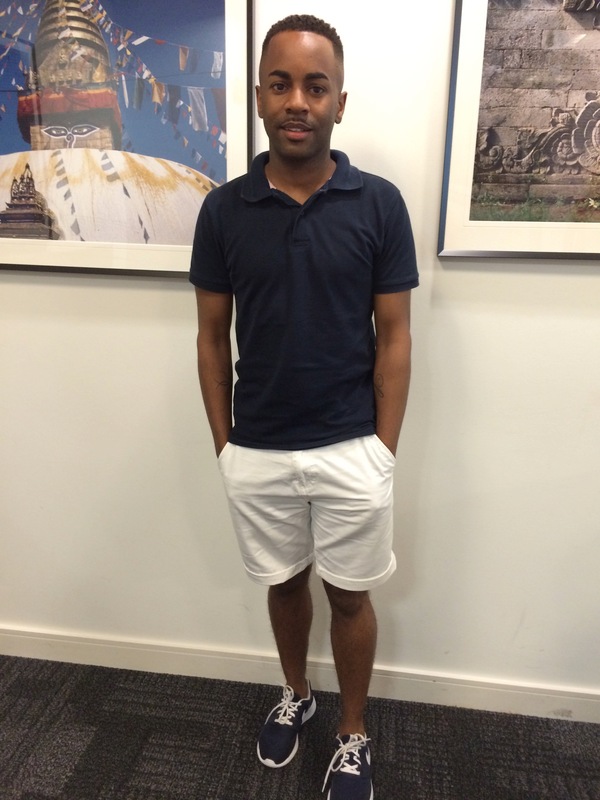 Here is Notting Hill Housing Officer Lyron looking perfectly dressed for the weather. It is a very casual look, but suitable for visiting tenants at home, checking on repairs and generally making sure his customers are happy. I like the way he has chosen shoes that work with his polo shirt and shorts. Take your sunglasses and a hat and enjoy eating your lunch outside. Oh you have the wonderful Beene pattern too! I have made this so many times for different family members and me. For me, the downside of hot weather in London is definitely stifling in the tube, so, if I were working there I’d be thinking my outfit out from the feet up – walking shoes so as to be able to spend more of the journey above ground. Probably still have a plastic mac shoved into a bag too. I’ve been caught in torrential downpours on ‘sunny’ days before. Yes! I discovered that pattern through your website Jay. Your colleagues do look terrific!! We do get hot and humid weather but unfortunately our office towers are always over-cooled (for men in suits) and so I have to cover up. In fact my new office building is so cold I tend to wear pants or even sweaters in summer. Shame! Enjoy the nice weather. Alli – I heard today that many of them take plastic over-shoe protectors in their bags so that they can enter tenants homes without removing their shoes. Fancy that! I remember freezing in the Stoll Moss office because of the overuse of a/c and trying to remember to take in cardigans which I would take off upon exiting the building and into the balmy Soho summer air… As I commented on another blog, we had a casual dress code but did once get a stroppy memo telling us that shorts showing a portion of the buttocks was no longer acceptable (wasn’t me!)! Very interesting observations, as ever, M. Thanks. Wondering if a “vest” is what I think of as a tank top? Here in the eastern US “tropics” we have a chance to develop expertise in dressing for hot weather – lots of loose linen tops, pants & dresses in evidence in the office and WAY TOO MANY very scary short shorts on tourists. Your gentleman in the shorts and polo shirt is a much more dignified and appropriate example of how to dress for heat! Thank you Ceci – very interesting. A vest is actually a piece of men’s underwear – a T shirt without sleeves. A tank top is similar I think but we would tend to use that term for a sleeveless jumper that generally goes over a shirt. An American vest I think is what we call a waistcoat. I seem to be drawn toward yellow lately, so the outfit Eve is wearing with the yellow accents looks fabulous to me, very chic! I’m in the eastern US also, and ugh, the humidity can be brutal. Eve’s dress is lovely, but looks wintery to me. I would steer clear of long sleeves, scarves, and anything knit on a very hot day, but I come from a hotter place (NYC) than London. Good point, and I agree with you Becca. I think she was compensating for our air conditioning! You have now got me on a hunt for that Geoffrey Beane pattern! Looks lovely on you. I think you can’t beat a white dress when the sun is shining. I came home from a holiday (when temperatures were almost 40) a week ago. So, 12 days of intense sunshine followed by pretty hot weather in the UK. It’s making me realise I need more lightweight loose clothing in my wardrobe. Well I am not an expert in either marathons or thrush. But I prefer wearing cotton or modal underwear. I make my own running shorts in stretch silk or synthetics but make integral cotton net knicker linings. For work on a hot day I wouldn’t wear performance fabrics.